Notes This recording created by the Judaica Sound Archives® from Cantor Schwimmer's “home recordings” encompasses an unusually large selection of material, beginning with the Rosh Hashanah evening service and ending with the S'lichot Service of Yom Kippur. 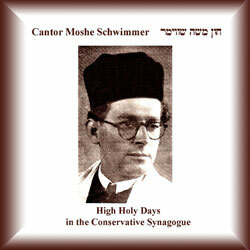 Cantor Schwimmer uses both traditional material known in many Western synagogues and also original compositions. The accompanying chorus is very supportive and effective.